RP24096 is rated 4.6 out of 5 by 24. Rated 5 out of 5 by Dichi from Easy to install. Stopped all leaking. I had these installed in four bathroom faucets about two weeks ago. No more leaks whatsoever! Reasonably priced and lifetime guarantee sweeten the purchase. 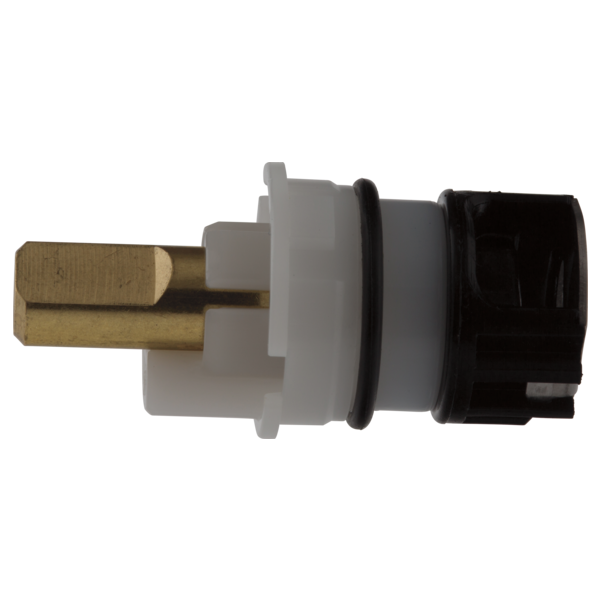 Rated 3 out of 5 by DERobCo from Delta Faucet replacement parts Ordering, shipping, delivery and installation of the "guts" inside the Delta Faucet handle was smooth and easy. However, the replacement did not "fix" the still leaking faucet. So, the takaway from this is don't buy Delta Faucets, I guess. They leak. Rated 5 out of 5 by Donmore from Great replacement replacement part works well. Rated 5 out of 5 by George from Exactly what I was looking for. Rated 5 out of 5 by TomA from Stopped the leak! Bought to stop leak in the hot water stem when we turned on the cold water. decided that we should replace both and now no leak. Rated 5 out of 5 by JBing from Like new again Bought this to replace a cartridge that had a plastic stem, that item never worked right. The stem had too much flex and I was afraid it would snap off. This replacement works great. Rated 5 out of 5 by harry339 from Exact part for the job Found the parts detail in the on line manual; web site allowed for an easy search, placed order and all came in 5 days. Thank you for your question. Since Delta Faucet part # RP24096 is a stem unit that is inside the faucet, it depends on which series of faucet you pick as to which accessories we would recommend. Does the rp25513 stem fit the 4577 faucet? &nbsp;Or is it the rp24096 that fits the 4577 faucet? Parts lists are not clear. Thank you for your question. If you are referring to the seats and springs in Delta Faucet part # RP4993 that sit underneat the stem assembly, then the answer is the small part goes up. I have a Delta 3569 faucet that water is leaking from the hot water handle. Is this theO- ring on RP2409 or the seat and spring RP4993? How do I move the right hand stem stop 180&deg; so it will line up? It only leaks from the hot water side Even when I turn on the cold water only... Do I just replace the cartridge or am I totally off on how to repair this problem? Thanks for any info! Can I use parts RP47422 to replace? Thank you for your question. If you have Delta Faucet model # RP24096 in your wall now, you will not be able to use the RP47422 as a replacement. The RP47422 does not use a seat and spring and the RP24096 requires one. is the brass stem part of the pr24096 stem assy? Thank you for your question. Delta Faucet model RP24096 and RP4993 are integral parts of a faucet. The RP4993 is placed underneath the RP24096 into the valve body. Then the stem assembly (RP24096) turns back and forth against the seats and springs (RP4993) stopping or starting the flow of water.